Home DoE Orders GeM MoF ORDERS Procurement through Government e-Marketplace (GeM) - Clarification reg. 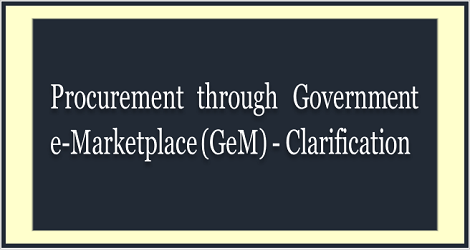 Procurement through Government e-Marketplace (GeM) - Clarification reg. Only in case of goods and services of required specification or within required delivery period etc. are not available on GeM the procurement without quotation or procurement on the recommendations of a duly constituted Local Purchase Committee. New Delhi dated the 19th January, 2018. Subject:- Procurement through Government e-Marketplace (GeM) - Reg. The undersigned is directed to refer to Ministry of Science and Technology (MST) OM No. MST/PRAO/Estt/22-38/2017-18/1952 dated 12.01.2018 forwarding the Minutes of the Standing Committee of MST on GeM, wherein it was pointed out that there is divergence between Rule 149 and Rule 154 & 155 of General Financial Rules (GFRs). In this regard, it is clarified that Rule 149 of GFR provides for the mandatory procurement of common use Goods and Services by Ministries or Departments for Goods or Services available on GeM. Hence only in case of goods and services (of required specification or within required delivery period etc.) are not available on GeM the procuring entity can resort to Rules 154 and 155 of GFRs i.e. procurement without quotation or procurement on the recommendations of a duly constituted Local Purchase Committee. 2. This issues with the approval of JS(PF C-II).